Gosh that description is a bit of a mouthful.…and what a delicious mouthful it was! Providing a filling 462 calories, 17g of plant-based protein and 50% of my fibre for the day, this salad is anything but boring — the combination of roasted rainbow baby carrots & asparagus, rainbow chard, radishes and salad onions provide nearly 500% and 50% of my Vitamin A & C requirements respectively! Not to mention 54% of my Iron, which is great news for all you vegans out there. The wonder grain that is quinoa provides a whole host of micronutrients, complex carbs and protein; a sprinkling of pistachios for healthy fats and some organic sprouts to really up the nutritional profile! · Lightly coat the carrots in some oil and season with Himalayan salt, pepper and any herbs/spices you fancy (I used the trusted combo of smoked paprika and turmeric). · Roast for 20–30 mins until starting to brown slightly. · Add the asparagus to the roasting tray for the last 10 minutes so that they too get some colour. · While they are roasting, finely slice the salad onions and the radishes. 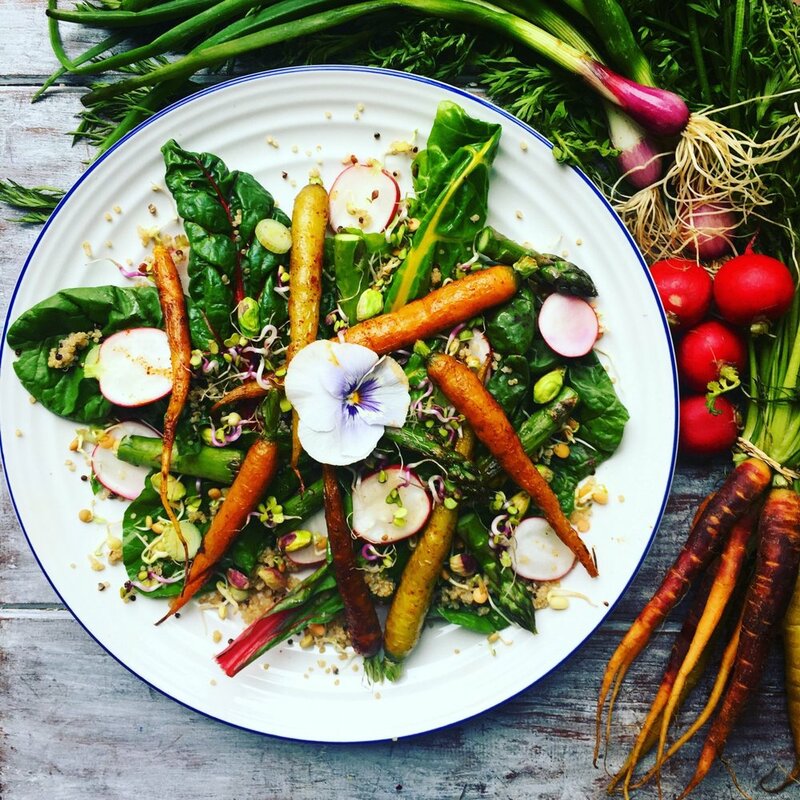 · After the carrots and asparagus have cooled slightly, assemble the salad and enjoy!